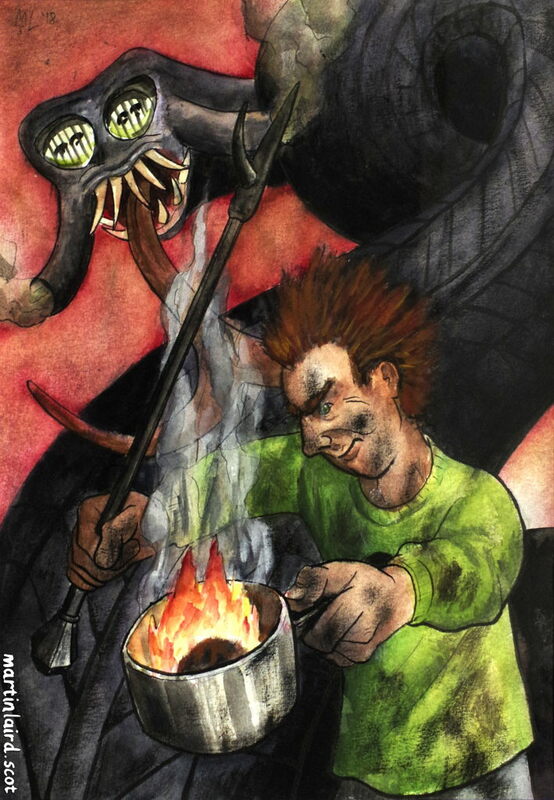 Assipattle battles the Stoor Worm with a pot of burning peat. Assipattle wi’ a pot o’ paet. 420x297mm. Watercolour & black ink, 2018. In the folklore of the Northern Isles, Orkney, Shetland, and the Faroes were created from the teeth of the monstrous Stoor Worm, which was slain by the unlikely hero Assipattle. It’s body became Iceland. Assipattle was a farm hand, and a feckless, lazy dreamer. He would lie by the fire and get covered in soot and ash. The Stoor Worm belched smoke, and was defeated by Assipattle using a lump of burning peat. Fossil fuel seems to play an important part in the story. For his efforts, Assipattle was rewarded with marriage to Princess Gem-De-Lovely, and went on to become King.